A leading artist of the 1980s “Lowbrow” movement is visiting Virginia, and his exhibition at the Virginia Museum of Contemporary Art (MOCA) is his first solo show in almost a decade. 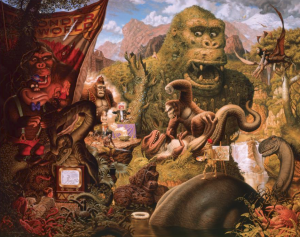 Todd Schorr’s paintings are staples of pop surrealism, populated by classic cartoon and comic figures from the mid-twentieth century. Todd Schorr: Atomic Cocktail is Mickey Mouse, Mr. Peanut, and the fairytale grotesque like you’ve never seen them before. “I was among a handful of artists in the mid 1980’s who began exhibiting paintings in galleries…that combined a common influence of imagery derived from old comic books, early cartoon animation, horror and sci-fi movies, hot rod culture, and psychedelic poster art,” Schorr said. Growing up in the late 50’s and early 60s, Schorr was inundated with the constant looming threat of nuclear warfare. From “Duck and Cover” drills in school, to the culmination of the Cuban Missile Crisis, his work combines the tension of those decades with the popular visual culture of the era. Fusing the influence of Renaissance masters like Salvador Dali, and early animated cartoons, Schorr created a cocktail of psychedelia and surrealism. These often autobiographical works take us into the looking-glass-esque world of the bizarre. He communicates through a synthesis of childhood experience, and the pervasive visual culture that shaped it. Schorr said that the basis for what we consider pop-culture began at the turn of the 20th century. MOCA curator Heather Hakimzadeh, says that despite growing from the same 1950s roots as its creator, the exhibit will appeal to everyone. Schorr’s exhibit contains a narrative flow that will allow viewers to connect the pieces within the context of their own stories, and provides a commentary on the endurance of visual art in our modern world. Our children are raised on popular iconography, and the generational consequences of these works bleed through decades. These early- to mid-century cartoons, comics, and classic films shaped our school principals, our heads of corporation, and the baby boomers who are in congress making policy, said Hakimzadeh. She wonders how the imagery our children see every day in our age will affect who they become as the next generation. Despite it’s universal, monumental implications, Hakimzadeh said one of the best things about the exhibit is that it is accessible to everyone. Alongside the show, Schorr is promoting his new monograph, Neverlasting Miracles. 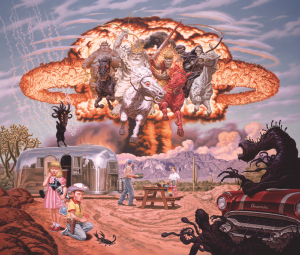 Todd Schorr: Atomic Cocktail runs through December 30 at the Virginia Museum of Contemporary Art in Virginia Beach. Over the weekend local artist Nils Westergard started painting over near Belmont and Patterson. 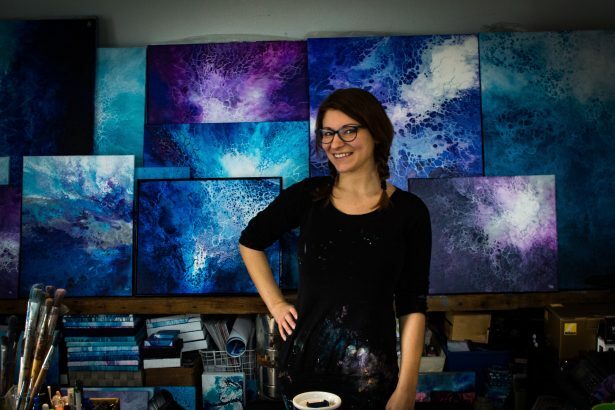 “It’s really hard to describe what I do,” said abstract expressionist artist, Mallory Page.